There are a million posts out there about fueling for long runs. Most of them have great information about nutrient amounts and timing, as well as the types of fuels that tend to work best. A lot of that information is applicable to erging (and rowing). For example, the recommended calorie intake for sessions lasting longer than 90 minutes is generally 200-300 calories per hour. (Anybody going longer than 3 hours might want to revise that number for their own needs.) This is about how much nutrient your body can theoretically use while exercising. Water intake recommendations are widely varied, from prescribed fluid and salt intake to the advice of "drink when thirsty". The articles also have great advice for foods that don't slosh in the stomach, and finding foods that work well for you. Dates, bean burritos, chia seed slurries, Gatorade, Gu and more have been recommended countless times. None of these articles, though, talk about how to eat when both of your hands are occupied holding onto the erg handle. What then? Short of having somebody feed you—not an easy task when the target mouth is moving—the best option is fuel that can be consumed one-handed. 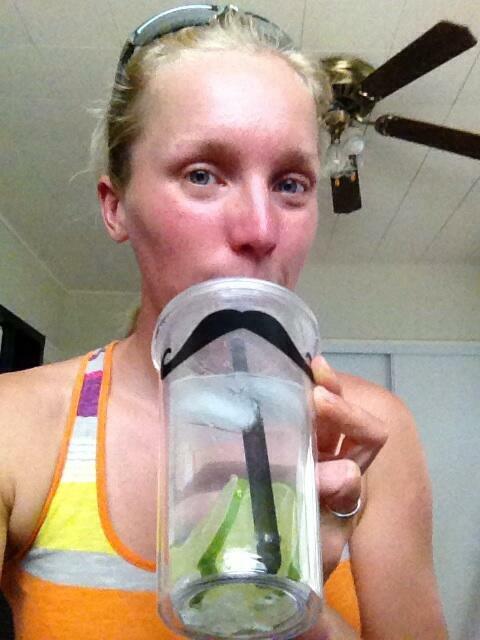 Since there's less sloshing in erging than running, liquids are a great way to get calories. During rows of 90-120 minutes, I usually keep a bottle of Gatorade nearby. Smoothies, diluted juice, sugar water and sweetened iced coffee or tea are also great options. The important piece is how to get the fluids from container to mouth. 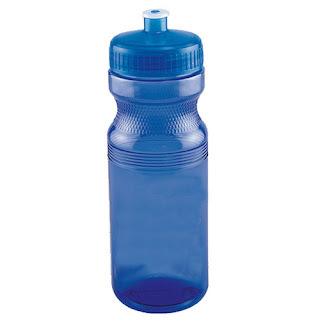 I prefer a water bottle with a squeeze top, like common cycling bottles. These don't work well in the boat, but set next to the erg, they're a great second choice. They work better than bottles for thicker beverages like smoothies or chia slurries, but interfere with breathing a bit more than a squeeze bottle. In running, light foods are preferable because they are easy to carry. Less necessary on a long erg. Although Gatorade usually does the trick for me on shorter workouts, the occasional two hour erg session requires a bit more. If I'm taking rests during the workout, I'll opt for fruit as much as possible. Watermelon and grapes are definite favorites during workouts. If I'm trying to eat while erging, fig cookies are a favorite. If it's an easier workout (i.e. I'm not going to be sucking air), I can shove the whole cookie in my mouth and chew/eat over the course of a few minutes. If I'm expecting to be short of breath, I will cut the cookies in half so I can breathe, chew and eat simultaneously. In all of this, it's easiest to incorporate food and beverages if they're within easy reach. I recommend a low table or shelf next to the erg if possible, but otherwise place bottles/foods at arms reach when you're at the finish of the stroke: that way you have the recovery to grab and eat/drink. Beyond food and water intake, comfort is a big factor on long erg workouts. The handle gets sweaty, clothing starts to chafe, blisters form, etc. Dealing with those issues can change the pleasure of an erg workout. In all of these, I find excessive sweat to the biggest factor. When I erg on a hot day, I try to get as many fans going as possible. Counterintuitively, I also wear a t-shirt, rather than go without, to help absorb some of the sweat and prevent it from dripping to my hands. Keeping a towel nearby helps deal with sweaty handles and blisters. I tend to also get chafe from long erg workouts. The seats are not particularly comfortable, and swinging back and forth repeatedly causes a lot of friction and wear on my skin. To help, I start with preventative measures: I pre-apply cornstarch, petroleum jelly, or lotion to areas prone to chafing. I've have also found that spandex with great compression help prevent chafe most successfully. Finally, sitting on a towel or seat pad helps a lot. Any other tips for long erg sessions? Interesting post.. I've been thinking about putting my self through a marathon distance on the C2, and I've been mulling over the fuel question a bit.When I did long triathlons, or even training rides I'd fuel mostly with liquids- Hammer Perpetuem was my favorite. I had some nausea issues with solids. I feel really sea sick on the erg if I've eaten much solid food before rowing and don't indulge in a mellow 2K warm up before turning it on for intervals. Have you tried a fruit smoothie? I can imagine a banana-based smoothie with a bit of extra fruit would go down well. Maybe try adding oatmeal.